In the following article Mediterranean Antiquities historians Carol Thomas and David Coblentz, use an African-headed Greek coin to explore the little known yet often controversially debated historical relationship between Ancient Greece and Egypt and by extension, the larger connections between Africa and Europe. Their article on their findings appears below. A tiny object can rewrite history. 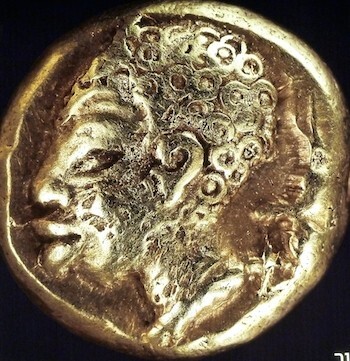 In this case, the small electrum coin featuring the head of an African pictured here reveals a fascinating link between Africa and Greece from antiquity to the present. Unfortunately we know very little about the coin itself except that it is from the early classical period and is now in a private collection. Its very existence, however, indicates that the link between Northeast Africa and Southeastern Europe began millennia ago. The earliest finds of human ancestors come from Africa. Stone tools discovered in Ethiopia have been dated to about 2.6 million years ago when survival depended on success in managing wild animals either by hunting or taming, identifying wild edible foods, and mastering the physical conditions of the environment. Success brought increasing control of the environment as well as evolutionary advance in the human brain. While few environments of the African continent were more conducive to agriculture, creating a huge garden along the Nile River was difficult: it demanded a high level of technology and the cooperation of large numbers of people to control the annual flooding along both sides of the river’s 600 miles. Herodotus, the father of history, in his researches to understand the cause of the conflict between Persia and Greece, somewhat surprisingly began his inquiries in Egypt. He learned that Min, the first king of Egypt, exercised control from the city of Memphis and had been succeeded by 330 rulers. By 3000 BCE, 4,000 square miles of cultivated land was the core of a unified Egyptian state. Location on the southern coast of the Mediterranean was another advantage contributing to the wider importance of Egypt. The sea’s name means “the middle of the lands;” it is the point of juncture of several of the largest land masses on the globe. While the Mediterranean is expansive, conditions encourage navigation: even in the more sizeable eastern waters, sailors are rarely out of sight of land, either a portion of the coastal ring or one of the numerous islands. Winds and currents and minimal tides facilitate sailing from the Strait of Gibraltar along the southern coast, up the coast of the Levant and Anatolia, turning west along the coasts of Greece and what is now Italy, Southern France, and Spain to return to the Strait of Gibraltar. Egyptians had incentive for taking to the sea in their earlier training in navigating the more manageable Nile and in the trade potential of the wealth of Egypt in its crops, animals, and specialized products of dessert resources of metals and stone. Thus Egypt became a major player, perhaps the major player, among the kingdoms of the Eastern Mediterranean and the Near East in the Bronze Age extending, roughly from 3000 to 1200 BCE. Trade fostered intense maritime interaction between coastal regions of Eastern Mediterranean. By 1400 BCE Egyptian imports found in six Aegean centers on the mainland of Greece and the island of Crete have been interpreted as the desire of Egypt to establish connections with a relatively new power. As others learned the wealth of Egypt they were eager to take direct control of it. Thus, foreigners generally were feared and non-Egyptians were welcome only as traders within designated trading centers. The entire Eastern Mediterranean learned the wisdom for such fear in the late thirteenth century when the thriving interaction of the sea was fractured by groups of marauding peoples such as the Peleset, Denyen, Tjeker, and Weshesh, some attacking by ship, others marching by land. Rebuilding structured communities even at the local level was slow and the return of strong international connections was even slower. Throughout the Eastern Mediterranean most regions experienced the gradual enlargement of small states. Egypt, however, was resuming its status as a unified kingdom in the seventh century. Somewhat surprisingly, Greeks, whose lives were now defined by hundreds of small independent communities, were significant to Egyptian reunification. As Herodotus recounts, the successful political unifier of Egypt, Psammetichus, (664-610 BCE) sought advice from an oracle whose reply was that bronze men from the sea would assist him. Sea-raiders from Greek Asia Minor did arrive, wearing bronze armor, and were persuaded to assist the would-be pharaoh. In return for their success, he awarded them land on each side of the Nile River, a grant that was far more significant than the right to trade occasionally in a specified emporion. Greeks were allowed to reside in Egypt; perhaps, initially, only to ensure the success of Psammetichus. Yet, in the early sixth century Pharaoh Apries (589-570) relied on the military aid of these same Greeks and his successor Amasis (570-525) granted a Greek emporion at Naukratis the privilege of being the single center for trade conducted by its residents, Greeks from specific states in the Aegean and Egyptians, together with non-resident foreign merchants. The economic privilege was accompanied by mutual respect for cultural differences: the Pharaoh’s grant included land for altars and sacred enclosures of the Greek residents. Herodotus wrote that he would never admit that certain similarities between Greek and Egyptian customs as mere coincidence. The excavated evidence from the site of Naukratis demonstrates this commingling. Following the Greek victory over the Persians in 480-79, Greeks formed a League to further limit Persian power. Forming a coalition of 143 states eager to end the Persian threat; they would cooperate under the leadership of Athens. After a decisive defeat of the Persians in 469 or 467, Athens led Greek states in an attempt to free Egypt from its Persian overlordship. Athens, not privileged Naukratis, was in pursuit of its own empire and knew the value of the inclusion of Egypt. The Athenian attempt failed. A century later, Alexander the Great of Macedonia inherited his father’s mission of freeing the Greeks from Persian control. After the success of the Macedonians in Anatolia and the Levant, he turned to Egypt. In 333-332 BCE his army wrested control of Egypt from the Achaemenid Persian Empire. More than the wealth of Egypt, Alexander cultivated a special relationship with the Egyptian god Ammon. Alexander trekked to his oracle at the oasis at Siwah, deep in the desert to the west of the Nile, to ask the god about his parentage. Although Alexander himself died only a decade after conquering Egypt, the family of Alexander’s general, Ptolemy, ruled Egypt for three hundred years. When it was at its most powerful, this “Ptolemaic” dynasty extended its rule south along the Nile into modern Sudan and also along the Mediterranean coast into modern Libya. As might be expected, the Ptolemaic period saw an increasing fusion of Greek and Egyptian culture. The Ptolemaic rulers encouraged Greek colonists to settle in Egypt. They came, settled widely, and brought their laws, language, and gods with them. And the Macedonian conquerors were in a position to impose elements of Greek culture on the Egyptians. However, major Egyptian deities such as Isis and Osiris were sculpted in the Hellenic style and became widely worshipped both in and outside Egypt by non-Egyptians, including Greeks. In time, Isis worship became one of the most popular religious traditions in the Mediterranean world and some of the last pagan temples to survive through the Roman control of Egypt beginning in 30 BCE and the slow Christianization throughout its empire were temples to the goddess Isis. The Greek language also influenced Egypt. While native Egyptian scribes had begun simplifying the ancient and complex hieroglyphic system long before Macedonians ruled Egypt, either during the late Macedonian or early Roman period, some Egyptian scribes began to use the Greek alphabet to write the native Egyptian language. These “Coptic” texts reveal considerable Greek influence on the native Egyptian language, at least among the educated class. This Hellenized Egyptian emerged as the final form of the ancient Egyptian language. After the Islamic conquest of Egypt in the seventh century CE, Coptic slowly gave way to Arabic. However, this process took a thousand years. Coptic may not have been extinguished as a spoken language until the early modern period. It remains today the liturgical language of more than 10 million Coptic Christians in Egypt and around the world. The deep relationship between Greece and Egypt persists to this day. Modern Greek history has been dominated by the struggle to achieve self-government rather than control by foreign powers through the king installed by Great Britain, France, and Russia. During the Second World War when Athens was under Italian, German, and Bulgarian military control, the Greek government was in exile in Alexandria, Egypt. The exiled government was especially attracted to Alexandria because it had received a large Greek population in the early nineteenth century. The modern Library of Alexandria, one of the great libraries of the world, evokes the Hellenistic Library goal established by the Ptolemaic successors of Alexander, who sought to house every extant manuscript of Greek works. That earlier library was completely destroyed by 391 CE. Its modern successor, the contemporary library of Alexandria, offers a wealth of resources, including ancient coins that testify to the enduring ties between Egypt and Greece from the second millennium BCE to the present.